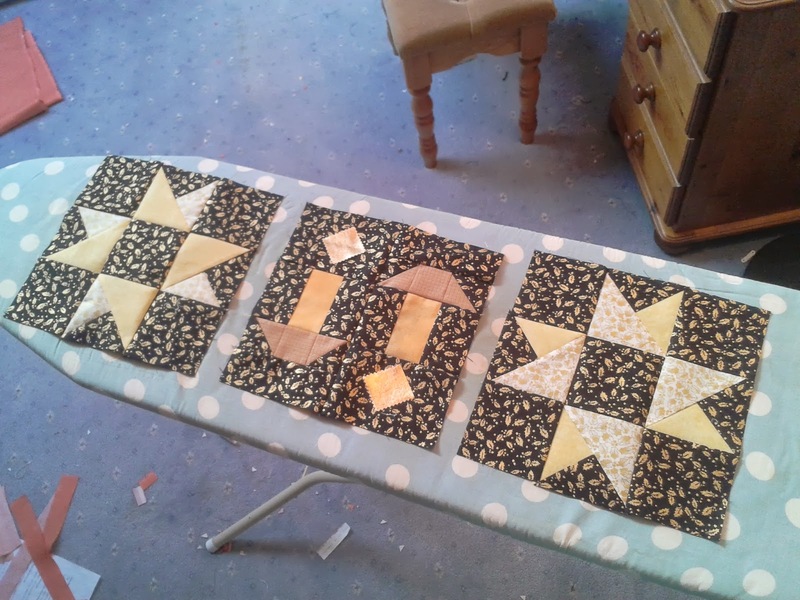 Well the Christmas QAL has spilled across into Monday for me because of all that daft vegetable and produce showing at the allotment show yesterday, so I've finished my second star block for the Challenge this evening. I want to concentrate on sashing and borders next month, which will involve some head scratching, I think, in order to make sure that I come in within the size restriction. Honestly, who on earth came up with such a daft Challenge?? So now I'm moving forward with Eleanor's Quilt, and have the first section of sashing done for that. I've got some tricky dicky cutting for the next bit, so I am not sure whether to press on with that, or if my concentration is up for the night! So for now, it's a big thank you to Jolly Joanna who has hosted this weekend (has anyone else noticed that we end up with some yummy snacks to eat on these QAL weekends?! ), and do say that you'll put next month's date in your diary - 7th and 8th September - and all come on over to my place to join me and Grumpy George the scarecrow for more Christmas QAL fun and frolics! Your runner looks great. Next time I paper piece I'm starting with chocolate. I thought the Sept. weekend was the 14th? Your blocks are looking good and I wasn't sure which weekend it was going to be. The 7th September is our Federal Elections and I'll be working on that day and believe it or not the 14th is the Lioness Quilt Show, so both weekends I'll be tired so will catch up hopefully with mine in the coming weeks so I at least have a photo to show. What are the size restrictions again, as I think mine may be to large? It was a great weekend! Your blocks look terrific! Your runner is looking great. Can't think who would have come up with such a daft challenge! See you in September.